BonusRollPreview allows you to see at a blance what the possible yields from a bonus roll would be. 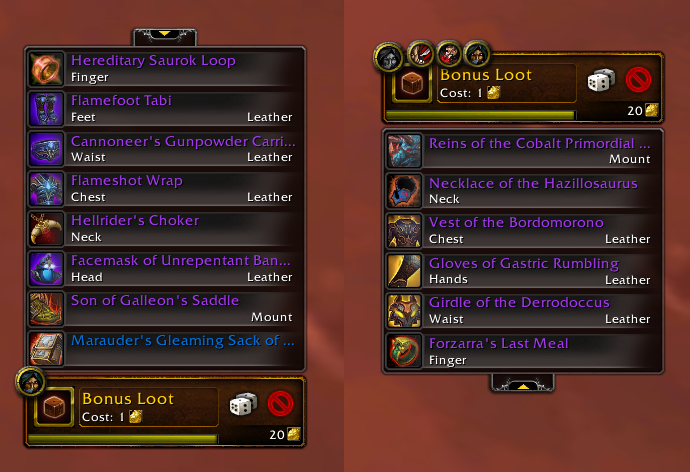 When the bonus roll window shows up, press the arrow button to show a quick preview of items. You can also change your loot specialization right from the window. So, from now on you don't have to alt-tab to a browser or open the Encounter Journal while on limited time. To move the BonusRollFrame, type /brp unlock in the chat, /brp lock to lock it, /brp reset for defaults. This addon was made based on an idea posted on reddit. If you have a question, please use the comments section on Curse/WoWInterface. If you would like to report a bug or contribute to the project, please follow this link to get started. Please see the LICENSE file. Removed: Compatability code for "Mists of Pandaria"
Changed: Rename the addon to "BonusRollPreview"
Fixed: Issues with item population due to misspelled event "EJ_LOOT_DATA_RECIEVED"
Your embed.xml files are loading non-existing libs. It's just a warning, the libraries are embedded, but they refer to libraries they themself require. The packager does not grab sub-embeds, which is why they are missing. XML load warnings are fine, and usually ignored. I'm adding support for that in the next update. my screen resolution is 1920x1200 and the preview of the items is always at the top of the bonus roll frame. So I can only see one item and the rest is cut off. Sometimes the arrow changes position to the bottom of the frame but the preview window still opens at the top. Where have you placed your BonusRollFrame, and with what addon (or code) did you move it? Screenshots would be nice aswell. Or I have an idea: I portet out of the instance on Gruul HC because I forgot the Bonusrolls and then got ported back, and the bonus roll window popt up, coud that be the issue? That sounds more like it, the encounter in the error is 1161, which is Gruul. I'll take a look into this. Last edited by p3lim : 03-06-15 at 12:48 PM. I'm not shure but in the error it says in German "Blackrock Foundry". Maybe Beastlord Darmac Mystic? If I don't get a confirmation that this is an issue on live I'm just going to ignore it as pass it off as a PTR oddity. 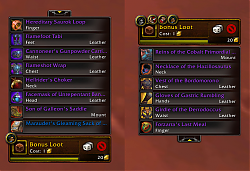 bonusrollpreview show normal mode loot list in LFR BRF. A screenshot of your chat would do fine if you don't have an addon to easily copy&paste. Last edited by EKE : 01-31-15 at 08:28 PM. If you found my addon useful, feel free to donate to keep my subscription active to let me continue developing.